With a nod to Charles Dickens, the past week held the best of times and came close to including the worst of times for Timberley and me as we managed to keep living in two western North Carolina towns at once—one, our hometown; the other, the college town where we worked for two decades before retiring as public school teachers last summer. This arrangement makes our answers to the questions “Where do you live?” and “What’s your home address?” difficult to answer, especially when they’re being asked by 9-1-1 operators, firemen, tow-truck drivers and auto dealership service managers. Thank goodness for cell phones and one number that fits all situations (I mean that in a couple of respects)—unless you’re on a mountain in one county and the nearest cell tower that your emergency call can hit is off the mountain in the next county. 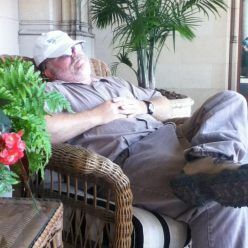 RAHN – Good evening, everyone. This is Weekend Update for Saturday, March 11, 2017, the end of yet another week in the Post-Truth Era of modern American life. Here’s Timberley with our lead story. TIMBERLEY – Thanks, Rahn. 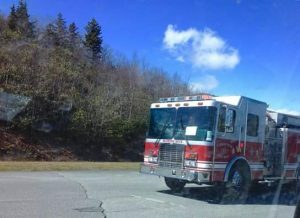 A carefree drive on the Blue Ridge Parkway almost ended in disaster Friday afternoon for two, uh, Burke, no, two Watauga—yeah, we’ll go with that—two, Watauga County residents, as the gas tank of their 2004 Jeep Liberty broke loose and spilled its contents at an overlook halfway up the Grandfather Mountain escarpment. No one was injured, and no fire resulted. Blowing Rock volunteer firemen answered the call to spread oil-drying compound on the spill. Back to you, Rahn. Rusty or loose gas-tank straps can result in this. RAHN – Thanks, Timberley. Gee, close call for those folks, huh? Good thing that gas tank the guy dragged a quarter mile up the Parkway was plastic, not metal, huh? TIMBERLEY – You’re right about that, Rahn. 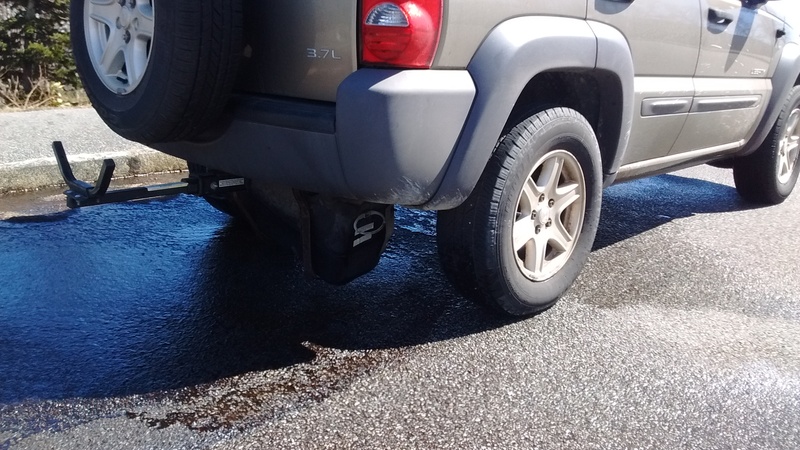 Officials say accidents like this are caused by rusty or loose gas-tank straps. So, all you readers out there, if you own an old Jeep Liberty, check those straps for rust and make sure they’re adjusted properly, OK? What else went on this week, Rahn? RAHN – In other news, for the first time in recent memory, the Boone post office box of Rahn and Timberley Adams was completely empty when they checked it this week—no direct-mail advertising with Hardees and Arby’s coupons, no Tractor Supply fliers, no magazines from AAA (whose wrecker would have had to come all the way from Wilkesboro, if we’d been able to call them) or Blue Ridge Electric Membership Corporation, no bills (thank goodness, again), and no return mail from President Trump, Senator Burr or Congresswoman Foxx … yet. TIMBERLEY – They still haven’t answered the letters you mailed to them almost two months ago? No? Wow, President Obama got back to you in that amount of time. RAHN – Two months? Gee, Timberley, it seems more like two years. Maybe President Trump has improved our lives. Maybe he’s found the fountain of youth—a week with him in office feels like a month, a month feels like a year! We’re gonna live forever … if he doesn’t get us all killed first! RAHN – Timberley, you—uh, you have got to be kidding. Not that metaphor again. You don’t root for the pilot of your plane if he’s a terrorist hijacker. And before you use the old “getting legislation passed is like making sausage” expression, how about we make sure Trump hasn’t gutted the FDA first? I like sausage and livermush and potted meat, all those meat-like foods that include everything but the oink. TIMBERLEY (rolling her eyes) – In other news, Morganton’s Brown Mountain Bottleworks hosted yet another successful Singer/Songwriter Night on Wednesday. Organized by blue-collar country performer Kevin Leftwich, the twice-a-month event featured short sets of original songs by nine local and area singers. The evening’s highlight was Mary Temple Ervin and David Williams’s new tune, “Bring It to the Bottleworks,” a song about the event itself. TIMBERLEY – Well, yeah, except for you. Why didn’t you stand up like everybody else? RAHN – I was adjusting my guitar strap. TIMBERLEY – That’s isn’t breaking news. It happened last night. Everybody watched it on TV and has already posted stuff all over Facebook about it. They were posting stuff during the game. It was like the presidential election all over again—all the mean stuff folks were saying about each side. RAHN – No, it wasn’t—like the election, I mean. TIMBERLEY – You don’t think so? Why not? RAHN – Simple. It was just a basketball game—a big basketball game, yeah, but just a game. It wasn’t a life or death situation—one, say, where one spark could have ignited a huge fire. Nobody’s gonna die because Carolina lost, and nobody’s really any better off because Duke won. It isn’t like the air is any cleaner and the water is any purer in Durham than in Chapel Hill—the two towns aren’t that far apart. And all the commentators are saying how “well-played” that game was. No, it wasn’t. Talk about being like making sausage…. On the whole, that was one ugly game, just like the Super Bowl last month. I don’t think either Duke or Carolina is up to even Nathan’s standards. TIMBERLEY (rolling her eyes, a third time) – Was that a Coney Island reference—to Nathan’s Famous Hot Dogs at Coney Island? Because the ACC Tournament was held in Brooklyn? RAHN (with a sausage-eating smile) – Yeah, and I linked it to my earlier sausage editorial. Neat, huh? TIMBERLEY (straight-faced, staring directly into the camera) – That’s all the time we have tonight, folks. Remember, any opinions expressed here aren’t necessarily those of the management, just those of the sausage-head who expressed them. Good night, God bless, and don’t forget to check those straps. I’m glad y’all are safe! Keep writing and singing! Next Next post: Faith or Good Works?